Even when the shrine fell to floods, smugglers and drug addicts, Muslim devotees never failed to leave offerings at the guru’s grave. The Ravi river meandered through the lush green field in front of us. The sky was overcast, the early monsoon clouds threatened to burst open yet again. Just a while ago, from a temporary camp set up outside the Kartarpur Sahib gurdwara, I had watched news of flooding in various parts of Pakistan. Finally, after years of yearning, I had found the time to visit the final resting place of Guru Nanak in Kartarpur, a small village an hour’s journey from the city of Narowal. The Ravi, otherwise parched, looked resplendent. It would flow like this for a few kilometers after which it would enter Indian territory, constantly flirting with the international border before finally deciding to settle in Pakistan. One such tribute by the river that consumed the shrine a few years after the death of Guru Nanak (1469-1539). It was then reconstructed on the western side of the river, at its present location. Abandoned at the time of Partition, the gurdwara came under the control of smugglers who travelled between the two countries frequently. The international border is only a few kilometers from here. In the 1980s and 1990s, as heroin flowed through the streets of Pakistan due to the policies of the Islamist dictator Zia-ul-Haq, many drug addicts found refuge in this gurdwara far away from the gaze of civilization. However, despite its dilapidated condition, a few Muslim devotees of Guru Nanak continued to visit the shrine and leave offerings at his grave. Legend has it that after Guru Nanak’s death, a conflict arose between his Hindu and Muslim devotees. While the Muslims wanted to bury him, the Hindus wanted to cremate him and build a smadh for him, for he had been born in a Hindu family. Amidst this tussle, Nanak miraculously appeared as an old man before his devotees, who failed to recognise him. He suggested they postpone the decision till morning. But in the morning, his body had disappeared and a pile of flowers had replaced it. Half of the flowers were buried following Muslim rituals and the other half was cremated and then a smadh built over it. His shrine now contains both the grave and the smadh. Out in the courtyard, the grave rests under an open sky while the smadh is inside a building that serves as the main congregation hall. Even while I stood there talking to Indrajit, I noticed a Muslim family, an old man and a woman, bowing in front of the grave, seeking its blessing. For them, like several others, Nanak was a Sufi saint, a holy figure who could intercede with the divinity on their behalf. 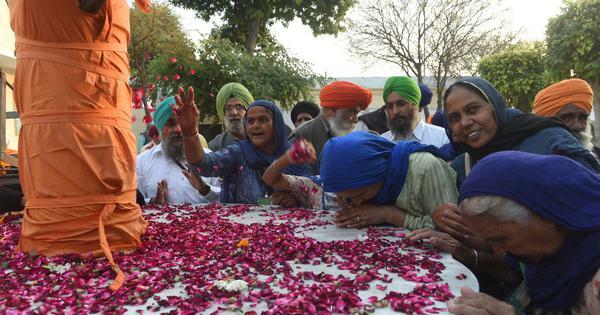 Thus, for almost 50 years, as the shrine was abandoned by Nanak’s Sikh and Hindu followers and served as a den for smugglers and drug addicts, a handful of Nanak’s Muslim devotees continued to visit it, bowing to his grave, keeping the sanctity of the shrine alive. It continues to hold the same importance for them even today as it has been transformed yet again into a full-fledged gurdwara, visited by hundreds of Sikhs every year. “The current structure of the gurdwara was raised in 2001,” said Indrajit. “That is also when we prepared our first langar here after Partition.” Langar is a tradition that began with Guru Nanak and is an essential feature of a functional gurdwaras. “Do the Muslim devotees also eat langar at the shrine?” I asked. Many Muslims in the country believe that sharing utensils or eating with non-Muslims would somehow corrupt their purity. While covering the lives of Sikhs living in the city of Nankana Sahib, the birth place of Nanak, I had visited a few restaurants that either did not entertain Sikh or Hindu customers or offered them separate plates and glasses. In bigger cities such as Lahore, the situation is not much better. This is what Nanak wanted, humans irrespective of their religion, caste or creed, sitting together, sharing food. Any place where that became possible would become the home of god, the pathway to divinity – guru dwara. In Pakistan, where there are now only a handful of functional Sikh gurdwaras, this becomes possible only at Kartarpur Sahib. Muslims at all the other gurdwaras have been disallowed because of security reasons. However, here at the final resting place of Guru Nanak, his Muslim devotees continue to visit him, keeping alive the legacy of Nanak in its true essence.